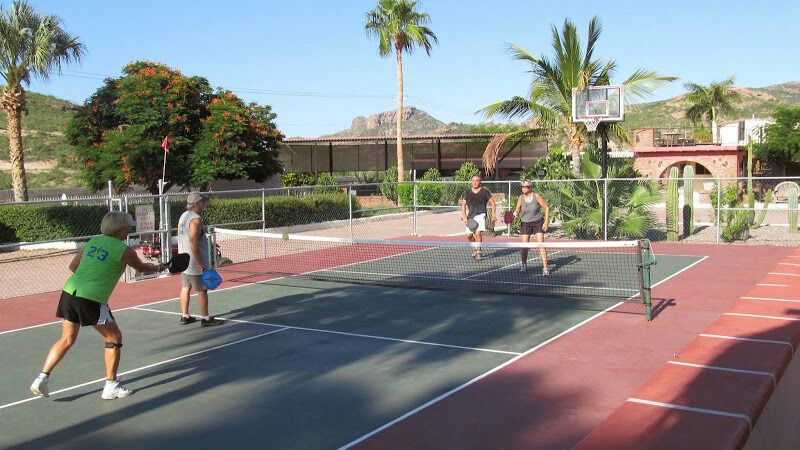 San Carlos, Mexico has a very active pickleball community with beginner and advanced players playing at a dozen courts around town. There are 8 courts that are open to the public. Mirador Courts has 6 new pickleball courts with a beautiful view of the water. Everyone is welcome to join. For a small yearly fee, you’ll get lots of membership benefits and support pickleball in the community. Learn more about Mirador Courts here and find out the costs and benefits of joining (like open play, scheduled play, drill clinics, guided play, tournaments, social events and more). San Carlos Gym (formerly Tony’s Gym) in the Ranchitos. For a small fee, you too can try your hand at this fun sport. Click here for more information about this court. Athleticlub San Carlos. Click here for hours, contact info and photos. Some gated communities in San Carlos have pooled resources and built member-only courts, including Loma del Mar and Tecalai. Sizzlin’ Summer Round Robin Tournament. Click for more information. Sun & Fun Round Robin Pickleball Tournament. February 7 to February 11, 2019: Sombrero Showdown and Amigos Cup. Under 60 & Over 60 (SSIPA) International Tournament. Register here (scroll to bottom of that page to register). The San Carlos Pickleball Association has been formed to help share the fun of Pickleball and develop support for the many players in San Carlos. Website: sancarlospickleball.com. Come join us and join the fun! Membership in the San Carlos Pickleball Association is free and open to all. Members of the Association receive a periodic newsletter with pickleball happenings in town. To join the San Carlos Pickleball Association email Christa at christa@whatsupsancarlos.com. USA Pickleball Association: The USA Pickleball Association (USAPA) was organized to promote the growth and development of pickleball, on both a national and international level. This organization provides players with official rules, tournaments, rankings and promotional materials. The International Federation of Pickleball Official Rules: click here. The Pickleball Channel and Poach PB on YouTube have lots of useful tips, how-to videos and full games. What’s bigger than a ping pong paddle, smaller than a tennis racquet, and shorter than a badminton raquet? The answer is: a Pickleball Paddle. One of the fastest growing sports in North America, pickleball is a racquet sport which combines elements of badminton, tennis, and ping pong. Two to four players use flat-sided solid paddles made of wood, composite or graphite to hit a perforated plastic ball over a net. The sport that was invented in the mid 1960’s by American Joel Pritchard has hit San Carlos by storm, and now many of us find ourselves looking for a court and some friends to play with. It is popular for men and women of all ages and skill levels. It works areas that few other sports do – improving your agility, balance and reaction time – without excessive wear-and-tear on your body. According to Wikipedia, the unusual name of the game originated with the Pritchard’s family dog, a puppy named Pickles. While playing the backyard game with family and friends, Pickles frequently disrupted the action by stealing the ball. The dog’s affinity for the ball led the family to call it Pickle’s ball, which spawned the name for the game. The pickleball court is similar to a doubles badminton court. The actual size of the court is 20 × 44 feet for both doubles and singles and a net and rules similar to tennis with a few modifications. The ball is served underhand from behind the baseline, diagonally to the opponent’s service zone. Points are scored by the serving side only and occur when the opponent faults (fails to return the ball, hits the ball out of bounds, steps into the ‘kitchen” area [the first seven feet from the net, also known as the non-volley zone] in the act of volleying the ball, etc.). There are specific rules about playing in the ‘kitchen’, about allowing the ball to bounce before hitting it, and strategies about when to stay back along the baseline and when to get closer to the net. The first side scoring 11 points and leading by at least two points wins. Although the court is quite a bit smaller than that used for tennis, you’ll be surprised at the work-out you’ll get after an hour of play!